What exoplanet might reply us back? These signals are weak. There is now way we could detect radio transmissions of similar strengths lightyears away. Another thing to consider: whilst we have been transmitting for 100 years, that window is about to close as we move towards digital transmission which ideally is indistinguishable from noise as we aim for minimal bandwidth. Indeed, and let us also consider that most of the 'transmissions' we have sent anywhere are often in wavelengths that are hardly conspicuous to outsider receivers (i.e. not on the hydrogen line, though a few other such wavelengths exist) unless I am mistaken. Most seem to have been broadcast along fairly 'mundane' wavelengths. Watsisname touched upon the crucible of the matter - we seem to be very afraid of being noticed, even though the space/time between star-systems is basically the greatest defense imaginable. The 'nasty aliens' would need to be VERY dedicated to conquest and warmongering if they use sub-relativistic speed. If that is even what we are afraid of - which is just silly because the technological deference between civilizations would be so large there would be no 'conflict', unless we are spectacularly lucky and contact a alien civilization that is on the same level as us, in which case they could not make it over here anyway. Personally, I don't think radio contact between us and alien species on a distance planet will involve anything more then the first detection (unless it was from a source in our solar-system like a dormant probe). The time lag would just be too sluggish and communication would heavily rely on the one civilization or the other surviving in the intervening decades, centuries or even millennia, and of course keeping interested (we might be interested, but we don't know if THEY will). Other modes of contact seem more likely. Source of the post Other modes of contact seem more likely. "Zorlax the Mighty"... hmmm.... I'm thinking of creating a new profile..
A paper has been published that examines the Earth as an exoplanet from the context of transit detection methods from other stellar systems. So this is a little off-topic but I prefer to write this here since a new thread would be unnecessary in this case. The paper is called "Transit Visibility Zones of the Solar System Planets" and is quite interesting for those who want to adress the issue of aliens detecting us. 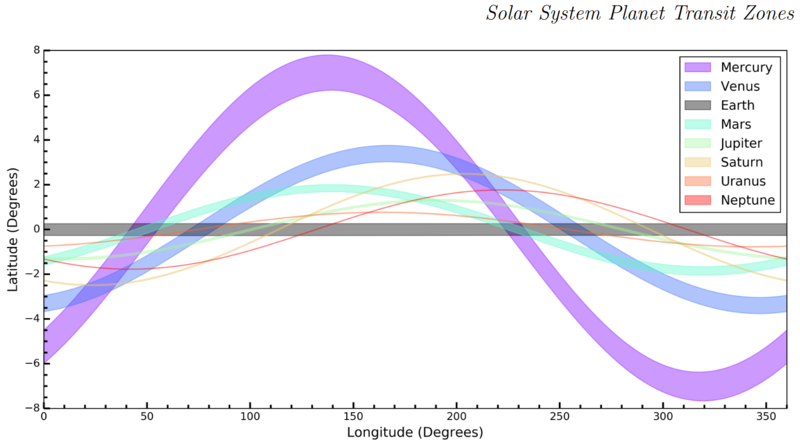 First interesting thing to note is that the ecliptic plane (the plane more or less containing the orbits of the Solar System planets) is inclined 60º to the galactic plane. That means that Solar System planets tend to transit the Sun as viewed from a general strip in the sky that crosses the plane of the Milky Way twice (antipodal points) but briefly. If the ecliptic plane was less inclined with respect to the galactic plane then miriads of stars of the plane would be in a vantage position as to observe transits in our Sun's luminosity curve. This means that the 60º inclination allows the Solar System planets to be spotted just from a very small group of stars, so we are quite advantageous in terms of camuflage from the point of view of alien lurkers (if they use the transit method alone). 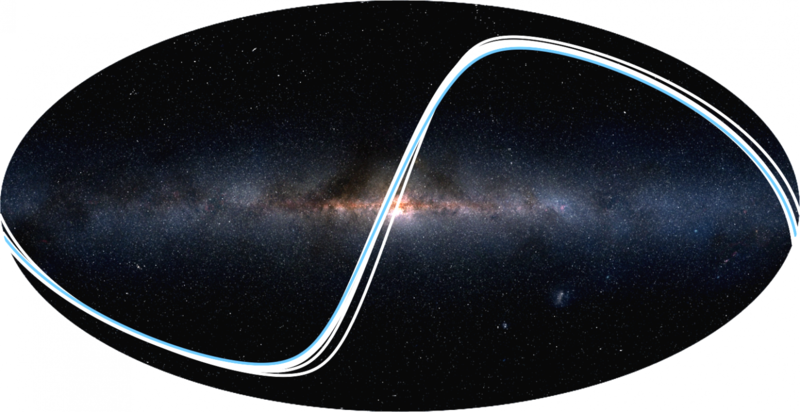 Here you have the strips corresponding to Solar System planet transit zones (blue strip for Earth) over a sky map in galactic coordinates; you can see that stars in Milky Way's center are prone to discover us. Since each planet in the Solar System has an orbital plane with a slight different inclination they generated also a map (in ecliptic coordinates now) from where each planet can be detected. As you can see Mercury has a wider strip. That's because been so close to the Sun Mercury is able to produce transits from many incident angles. As you get farther from the Sun your strip becomes thinner. A very interesting point they adress in the paper is the fact that no star in the galaxy would be able to spot more than 3 planets around the Sun by using the transit method. You can see that in fact the max number of strips overlaping is three. There are stars from where aliens would be able to detect Mercury, Earth and Mars, but they would never know about Venus, and so on. This is interesting since it means that we are also missing a lot of exoplanets in known exoplanetary systems (generally the ones that are farther from their host star). So the next they do is to try to calculate how many Sun-like stars could have aliens that could detect Earth using the transit method. Those not only have to be located in the Earth's strip of the sky but they can't be too far away (or the dimming would be technically challenging to study). They establish a visual magnitude limit of 13 (if the Sun looks fainter than that, due to larger distances or interstellar absortion of light then they wouldn't be able to spot our transit with sufficient statistical significance). The 13 magnitude limit was established just for comparison with human-level technology (this is going to be the visual limit for transit detection in ESA's PLATO telecope). So, how many G-type and K-type stars with Earth analogs (same size as Earth and embeded in the Habitable Zone of their host stars) fall in the Earth transit zone strip? None of the known exoplanets. But we know so little yet. Using statistical extrapolation of the frequency of Earth analogs around G and K stars they have discovered that around 3,2 habitable planets fall in the strip and are able to detect us for limiting magnitude of 13. Just 3!!! (and they say it is an optimistic value). What about M-type stars? those are more frequent than G and K so there should be more potential habitable planets in the correct position to detect us for these stars. Well it turns out that there has to be around 6,6 planets only. F, A, B and O type stars are extremely unfrequent in comparison so don't expect any aditional planets from them to fall in the strip (also consider all the habitability issues we have discussed for these stellar hosts). So in total we might expect only around 10 habitable planets in the Galaxy to be able to spot Earth just by using the transit method and having the same sensitivity as PLATO will have. We are really living in a dark corner of our galaxy where few intelligent beings are going to be able to spot us, if any. This paper will contribute to target radio SETI for the potentiall discoverers of Earth in that thin strip of sky. Source of the post So in total we might expect only around 10 habitable planets in the Galaxy to be able to spot Earth just by using the transit method and having the same sensitivity as PLATO will have. And given that a really tiny fraction of planets within the habitable zone would be actually habitable, the chance that some life form could be watching Earth transits can be safely rounded to 0. Yes, the transit method has limited use in the actual application of SETI, based on solar-system geometry alone, in addition to some of the other points presented here. There are a few other more useful ways to detect exoplanets, and almost all are meant to be used in conjunction. A great post and a great find FFT! You are right - here is the best spot for the paper's discussion. SETI (the actual project that is) is mostly about publicity anyway, and is struggling somewhat in that regard even. I highly admire their efforts and the science that goes into it, and I sincerely hope they do find something by sheer luck or devoted skill, but the trouble is that their time ratio for astronomical study operates on a timescale that could best be described as multi-generational. The best we can hope for them is that they (or a derivative) stick around for a few centuries until technology may allow for interspecies communication, whether physical or otherwise. It is almost a certainty that we will detect alien life (or even a civilization) via removed observation only anyway. What technologies/methods do you think show promise in detecting non-human activity?